Sensory tubs are a part of most preschool themes. A preschool beach unit works especially well with sensory tubs. Just think of all the senses you use at the beach. You feel gritty sand and cool water. You may handle slimy critters or rough shells. As children experience the beach and ocean, they can build vocabulary. They will learn to label items. They will explore descriptive language. If you can't visit the beach every day, you can easily bring the beach home. Even the youngest learners can experience the beach. I've shared a variety of beach sensory tubs as my boys have grown up. Here are a few of our favorite beach sensory tubs beginning with babies through preschool aged kids. The beach offers endless sensory experiences for babies. Even if you can't visit the beach with your baby, you can expose your baby to the way water moves and makes waves. You can label ocean animals and grow your baby's vocabulary. You can discuss the size, shape, and color off beach items. You can let your child feel cool water or rough sand. One easy way for your baby to participate in a beach unit is to create a baby wave bottle. Use a plastic bottle and let your baby move the water to make waves and see the critters in the water. Here are the full details on the baby wave bottle and other beach activities for babies. Toddlers will want to get into the action when you start studying the beach! Traditional sensory tubs can work well for some toddlers but others still put small objects in their mouth for a long time. Creating a beach sensory bag allows your toddler to examine small critters and beach objects without a choking hazard. 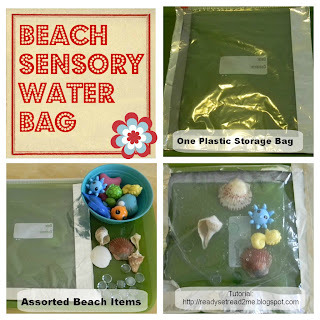 The toddler beach sensory bag is also great for building vocabulary and concepts. Children also love to experiment with the bag. As they push on one area, another area may move or sway. This allows the child to learn about cause and effect. A reader of my blog had a great idea to put this sensory bag into a kiddie pool or a water table and see if it would float! These sensory bags don't usually last long but they are easy to make! Once your child makes it to the traditional preschool age, sand and water tables are fun and easy sensory play. There are tons of ideas online for using these tables. However, many kids love just digging and pouring-- so don't feel like you have to do anything "hard". Adding elements like ocean themed toys, water beads, or shells, can make it more creative, though. You can even get crafty with a shell collage. I also have a round up of beach sensory tub ideas at Mom's Library this week. If you are looking for a full beach preschool unit, I have one for sale at my teachers pay teachers store. I also have a free beach book list. Have you used sensory tubs in your preschool beach unit? Thank you:) What kind of sand did you use?